Wrestling shoes are specifically designed to give you the most out of your body, moves and power in Wrestling matches and competitions. These wrestling shoes are designed to be lightweight and mimic as much as possible bare feet, giving more flexibility, traction and ankle support. Wrestling Shoes also give more support in the foot arch area, allowing the wearer to be quicker and lighter on their toes. They provide a low level of shock absorption, which allows much more response and feel through the sole. My Wrestling Room stocks the best youth and adult shoes in the amateur Wrestling world’s top brands of wrestling gear. First off, if your wrestling has a size foot less than five you want to choose from our wide selection of youth wrestling Shoes. Make sure to add ½ size to sneaker size in order to properly size your shoe. This is true for either Adidas or Asics Wrestling Shoes. Just make sure you know your wrestling sneaker size. Properly sizing wrestling shoes will avoid any hassles with them back for an exchange. Please know that My Wrestling Room will pay for the cost of shipping to send you back the shoe that fits. Just email us for a return authorization number and we will ship them to you immediately, even BEFORE we receive back the mis-sized shoes from you! 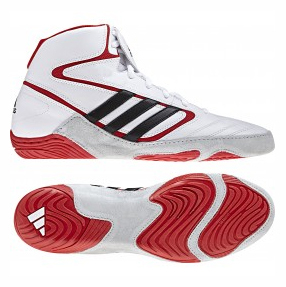 We carry a wide range of youth wrestling shoes. For the advanced youngster you can get higher end shoes starting in size 1 and up such as the Cael V4.0 wrestling shoes which retail between $60 and $70. These are available in black or navy. For wide feet we offer the Asics Split Wide and the Response GT. The Asics shoe is priced lower than the response and features split sole that some wrestlers prefer. A split sole allows for great bend in the arch of the foot when wrestling. The Response was first offered in 2010 and while it’s now discontinued, we still have a few left. So go with the Asics Split Wide if you need the room. We don’t recommend adding a full size to a shoe if you have a wide foot. Both companies make a great wrestling you. You will find that both are popular with college and high school wrestlers alike. We usually see a 60% to 40% split each year depending on new models available from each company. Most wrestlers tend to go for the “new shoe” that is the latest and greatest. Other wrestlers love their shoes that are worn, but comfortable and still extremely effective. You should consider replacing your wrestling shoes frequently depending on usage. Another factor that drives wrestlers to either Asics or Adidas is color selection. Wrestling shoes have come a long way from the mid 1970's, when only a black or white shoe was available. Today you can choose from an array of colors that match either your personal preference or your team colors. In recent years, we at My Wrestling Room have offered yellow, red, green, blue and even orange wrestling shoes! For the 2011 and 2012 wrestling season two popular colors will be the navy Cael V4.0 based on the Penn State NIttany Lion Colors and the Aggressor, which features the yellow and black Iowa style colors. Here you will find styles released this year, and some of the top sellers from the previous seasons. At My Wrestling room, you will find a range of incredibly technically advanced shoes, plus high quality wrestling shoes for beginners for both youth and adults. Usually start at about $40. You can choose from the new Matflex 3 from Asics or the Combat Speed III from Adidas. Interestingly some advanced wrestlers will wear these models especially the Combat Speed that they may have worn years ago as a youth wrestler when it first came on the market. These shoes range from $50 to $100 and include the from the new Protereo II, Cael V4.0 as well as the new AdiZero Wrestling shoes which are above $80. These shoes tend to have stronger material, better grip control, a wider range of colors. These shoes typically exceed $100 and offer the latest and greatest in technology. These products include the Asics Aggressors the new Mat Wizard 4 IV from Adidas. Both can be purchased for under $120. We will also be bringing to market the new AdiZero London Wrestling shoes, which feature The Adidas AdiZero London Olympics Wrestling Shoes feature Adidas groundbreaking AdiZero technology. It’s very lightweight and has split sole design. These will be available in February 2012 and we expect they will be priced above $125. In addition, Asics will be coming out with the new Asics Omni Flex wrestling shoes featuring ground breaking technology. It has an inner “boot” that is covered by an out shell! While it will be expensive, it will be in demand by the most advanced wrestlers. Every season newer styles and technologically advanced wrestling shoes hit the market, and My Wrestling Room is on the button when it comes to new wrestling gear. This season, you find new shoes from Adidas, including the AdiSTAR Beijing Wrestling Shoe, the Mat wizard 4, the AdiZero Sydney wrestling shoe, the Vapour Speed 2, The Pretereo 2 plus many other styles. Asics brings you the Mat flex 3 and the Mat flex 3GS wrestling shoes, new for 2011. You will find the pick of the best wrestling shoes on the market from this and previous seasons, in range of colors and sizes for both youth and adult wrestlers. We also stock a wider fitting wrestling shoe from Asics. Stalk the mat in the brightest, most technical wrestling shoes available, and pick your wrestling shoes from our massive range at My Wrestling Room.